It was 2014 at Samaritan Evergreen Hospice House in Oregon, and a ninety-year-old woman in a coma had been totally unresponsive for several days. The woman had no family or friends, and the staff expected she would pass very soon. Tracy, one of the nurses, went in to sit by her side during these final hours. While she was there, her dog, JJ, a staff 'therapist,' came to join her and hopped up on the bed. JJ snuggled up next to the elderly woman and nuzzled the woman's hand with her snout. And, the woman began stroking JJ's face. Somehow, JJ had reached her, wherever the woman was. Tracy was touched and quickly recorded it on her phone. In August 2015, that video went viral and has been seen tens of millions of times. 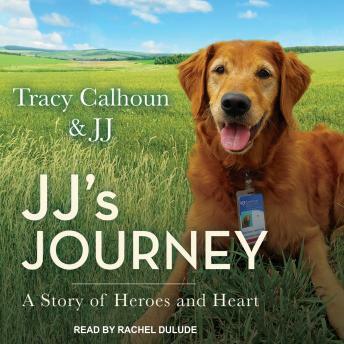 JJ's Journey is a heartwarming memoir of a nurse and her dog, and their combined efforts to bring peace and consolation to humans in times of crisis and grief. We learn about the work done at the hospice house and the different kinds of work a therapy dog does both inside and outside of hospitals. Rich with informative detail, we also learn the intricacies of training animals for this work, the complexities of recognizing whether the dog has the right personality, and how to engage their supportive spirit.